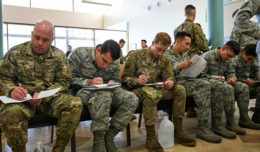 WASHINGTON – Starting this summer, the Defense Department will offer an additional counseling service to help military service members, transitioning troops and family members deal with a host of issues before they become crises. Peer-to-peer support, which will be available through Military OneSource, will offer assistance from counselors who have at least a master’s degree in the social or psychology field as well as military experience to help with a host of issues, Rosemary Freitas Williams, deputy assistant secretary of defense for military community and family policy, said yesterday. With that level of education and experience, Williams said, peer support counselors can chat confidentially with clients and assist with any underlying issues that might be associated with someone’s need to chat, online or by phone. “For example, a military spouse might call in and request to speak to a military spouse [counselor] because [he or she] is at wits’ end over relocating,” she said. During the conversation, the counselor might recognize underlying issues” that can range from finances to relationship or employment problems, she added. And because Military OneSource is the central one-stop service that offers military families a host of direct services as well as information on a vast array of resources, it made efficient and effective sense to add peer-to-Peer support to its list of services, Williams said. Such counseling services are not a new concept for DoD. Vets4Warriors currently provides peer-to-peer support, and its contract runs out in August. 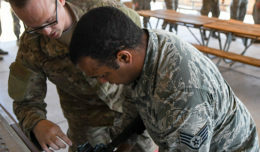 Peer-to-peer counseling will be available for active duty, National Guard and reserve service members, their families and veterans who are within 180 days of their military separation, Williams said. A client can talk to a peer-to-peer counselor via Military OneSource and, if issues necessitate, clients can receive a warm handoff to obtain up to 12 sessions with a clinical counselor, per issue, per person, Williams added. The proof of peer-to-peer support as an evidence-based approach to helping others has been well documented. Intuitively, it also makes sense, when people seek out a friend to talk to who’s had a similar experience, because it can alleviate stressful circumstances, explained Dr. Keita Franklin, Director of the Defense Suicide Prevention Office. “The peer-to-peer approach gets after the issue at the earliest possible point of intervention, so folks who get help early get better quicker,” Franklin said, noting the importance of getting service members and families peer support before a problem escalates. For transitioning service members who will soon re-enter the civilian sector, peer-to-peer counselors will offer their expertise during what might be a turbulent and life-changing time, Franklin said. 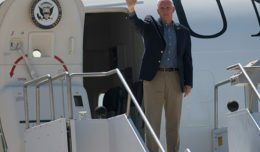 While peer-to-peer support is not a crisis counseling service, Military OneSource works with other organizations such as the Military Crisis Line or the Veterans Crisis Line as necessary, Franklin noted.